Functions with all electric fences with voltages of 0-10,000V. Avoid your animals getting out or other people getting in without your knowledge. The alarm system automatically monitors the voltage of the fence and sounds the alarm if it falls below 2000 volts. May be connected to the fence at any point. May also be used to warn of break-ins/broken wires by placing the alarm system at the end of the fence wire. Option of connecting to external alarm/siren. Simple, effective monitoring and alarm protection of enclosures to guarantee that your animals do not escape or to protect areas where you do not want unwanted visitors. The alarm system is a simple, cheap and particularly effective way of raising an alarm/message. 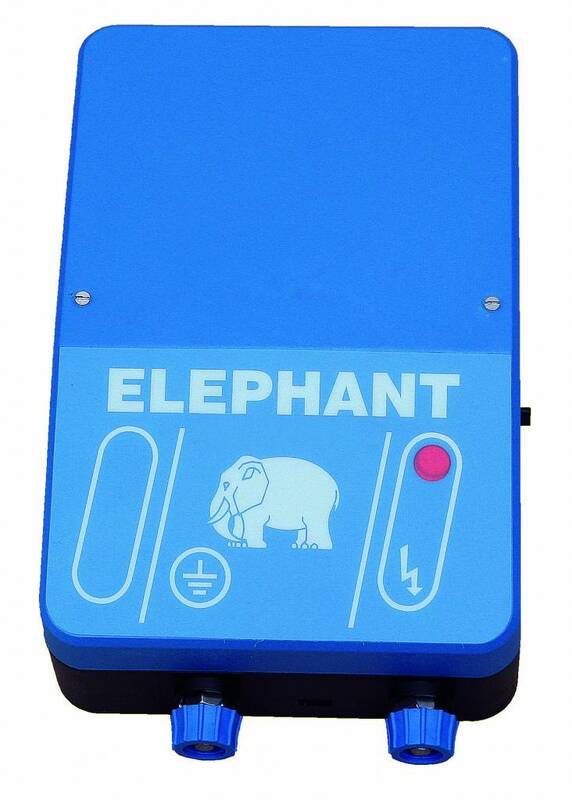 It is designed to work together with an Elephant electric fence to monitor the voltage in each individual enclosure or area and to raise an alarm if the voltage falls below 2,000 volts. This makes it easy to keep out uninvited visitors from, for example, a dark area in a business property, either by sounding sirens or by sending some other form of alarm to wherever you need it via the potential-free set of contacts. If you are having problems keeping your animals in because you have a large enclosure or a lot of enclosures that are interconnected, or perhaps because there is a lot of vegetation or some thick vegetation, the ideal solution is to connect an alarm system to your enclosure or enclosures, to monitor that the necessary voltage is always being supplied to your enclosure. The alarm system requires no special advance knowledge to set it up (see also under installation and control), and in most instances it can be installed in less than ten minutes. You decide for yourself whether you want to use the alarm system to raise an alarm if there are uninvited visitors or to keep your animals in, or for something completely different to which you need to be alerted. Whatever you use the alarm system for, they way it works is that the “acoustic device” inside the appliance emits a “wailing” signal when the voltage of the enclosure falls below 2,000 volts. As soon as the voltage rises above 2,000 volts again, the signal from the “acoustic device” disappears. The control lamp in the alarm system flashes as long as the voltage in the enclosure is above 2,000 volts and there are more than 5 volts in the batteries inside the alarm system, thus providing a clear indication that the system is fully operational. The alarm system has an inbuilt 84 Db “acoustic device”; if this is not sufficient, or if you want to locate your siren/alarm elsewhere, the alarm system has the facility to connect an external six-volt siren. In addition to this, any other external sirens, lamps and other equipment that may be necessary for the alarm system to have maximum effect can be connected via the internal potential-free relay. The alarm is fitted with four 1.5-volt batteries (LR14), which means that the alarm will still work if the supply voltage to the electric fence is “cut off” or disappears in the event of a power cut. The operating time of the four 1.5-volt batteries is approx. 7-8 months. The alarm system is easy to install and requires no special knowledge. It can be set up in only ten minutes. Once it has been screwed to a wall or wherever you want it to be located, all you have to do is draw a wire from the enclosure to the alarm system, attach it to one terminal and connect the other terminal to an earth rod inserted at least one metre into the ground. As soon as you have inserted the four 1.5-volt batteries and turned on the switch, the alarm system is operational. The alarm system can be connected either to the fence itself or to any place on the enclosure. If it is attached to the end of the wire, you will at the same time be able to check whether there is a broken wire. The inbuilt siren emits an alarm as soon as the voltage in the enclosure falls below 2,000 volts. The useful life of the four 1.5-volt batteries is 7-8 months, so if necessary place a label on the alarm system so that you know when you should replace the batteries.